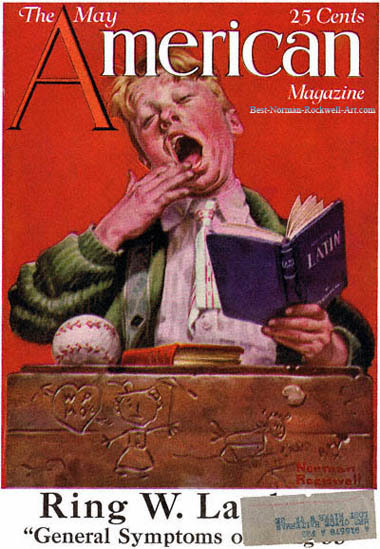 Sleepy Scholar, this Norman Rockwell painting, appeared on the cover of American published May 1921. This was the fourth picture by Rockwell to appear on the American Magazine cover. American Magazine only published seven Rockwell illustrated covers, between 1918 and 1923. Clearly, the smaller magazines desired Rockwell's signature and art on the cover to provide a boost in newstand sales. The artist was already very popular by the time this cover appeared. The original oil painting, 13.5 x 10 inches or 33 x 26 cm, sold at auction on September 27, 1990 by Christie's auction house in New York for $71,500. I have been unable to find its current location. This painting also appears in two Rockwell commentary books. It appears on page 24 of The Norman Rockwell Album and on page 7 of Norman Rockwell, A Definitive Catalogue by Laurie Norton Moffatt. In this portrait, Rockwell gives us a glimpse into how tedious school can be when the students are expected to learn. This scholar is studying Latin. There are really not many reasons to study Latin. Although, if a student is able to master a dead language, then he is more likely to be able to master a language still spoken. Is he really sleepy, or is his attention to the task at hand just waning? No matter how engrossed this young student may be in the subject, there always comes a time that his concentration is broken. Rockwell shows that moment. There are other objects competing for his attention. Another schoolbook lies on his desk. And beside that an object even more attractive to a young boy's mind: a baseball. Rockwell's attention to detail is visible in his treatment of the front of the desk. On the far left we can see a heart carved with an arrow through it. Inside the heart are the initials W P on top, M O underneath. Beside the heart is an artist's rendering of a woman with an umbrella. Presumably this figure represents the schoolteacher. Next to the schoolteacher, we can see a horse galloping. The final touch in the rendering of the desk is also the deepest. Someone has stuck their spent chewing gum on this desk. Some things never change. Do You Have A Great Story, Opinion Or Contribution About Sleepy Scholar?